BIRMINGHAM, Alabama, September 20, 2016 (ENS) – Gasoline is expected to begin flowing again Wednesday through a temporary bypass on a damaged pipeline in Alabama owned by Colonial Pipeline, one of the country’s biggest pipeline companies. The leak in Alabama forced a pipeline shutdown that has led to skyrocketing fuel prices and gas shortages across the South. Alabama state workers discovered a gasoline leak September 9 when they noticed a strong gasoline odor and sheen on a retention pond, along with dead vegetation and animals, according to a report by the Pipeline and Hazardous Materials Safety Administration, which is part of the U.S. Department of Transportation. The leak opened up somewhere on Colonial’s Line #1, a 36″ diameter pipeline that runs through Shelby County, Alabama, three miles from the town of Pelham. The failure resulted in the release of about 6,000 barrels (189,000 gallons) of gasoline into the retention pond about 460 feet north of Line #1. Benzene and gasoline vapor concentrations have been fluctuating at unsafe levels near the assumed leak site, making it impossible to safely excavate the damaged section of pipe to determine the cause of the leak, or even if the damaged pipeline is still leaking. The exact location of the leak is still unknown. The 500-foot (152-meter) section of pipe bypassing the damaged area was completed today, but supply disruptions may continue for an unknown number of days, Colonial Pipeline spokesman Steve Baker told the Associated Press on Tuesday. “When Line #1 restarts, it will take several days for the fuel delivery supply chain to return to normal. As such, some markets served by Colonial Pipeline may experience, or continue to experience, intermittent service interruptions,” Colonial said in a statement. Colonial “continues move as much gasoline, diesel and jet fuel as possible and will continue to do so until markets return to normal,” the company said. Crews have been working around the clock to clean up the mess. Colonial Pipeline spokesman Bill Berry told reporters on the weekend that a total of 519 Colonial employees and outside contractors are working in shifts to remove the gas and spilled material. Berry said there may be more gas inside the pipeline. The leaking part of the pipeline has not been excavated due to safety precautions, so Berry said the condition of the pipeline and the cause of the leak is still unknown. 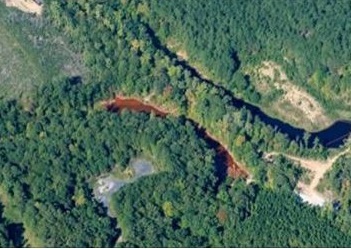 On September 15, Colonial officials reported that 54,650 gallons of gas have been recovered from the pond and another 36,980 gallons have been drained from an isolated section of Line #1 next to the assumed leak site. In addition, an unknown amount of gasoline has been found in another nearby pond. The failure occurred on a section of Line #1 that runs from Collins, Mississippi to Atlanta, Georgia. Colonial operates a parallel pipeline adjacent to Line #1. Line #2 is 40′ from Line #1 at the assumed site of the failure. Crews have installed temporary plugs in the pipeline on either side of the leak, and gasoline is being extracted from the affected section of pipeline at those plug sites. Georgia Governor Nathan Deal Monday issued an executive order reiterating state law that prohibits price gouging. “In order to remedy this, I’ve issued an executive order reiterating the state law prohibiting price gouging. “In addition to this, I’ve sought and received a waiver from the Environmental Protection Agency as well as lifted operating regulations for commercial truck drivers hauling motor fuel. I urge the public to maintain regular consumption levels and travel schedules in order to reduce further interruption in fuel supply,” said Deal. The EPA said in a statement Tuesday that sampling teams are working with the Alabama Department of Environmental Management, the Cahaba Riverkeeper and Colonial Pipeline to collect water quality samples throughout impacted and potentially impacted areas. The EPA said its water samples are consistent with the Colonial Pipeline Company water samples. “Current sampling results indicate that the Peel Creek and the Cahaba River are currently not impacted,” the agency stated. The federal Pipeline and Hazardous Materials Safety Administration, Office of Pipeline Safety, has begun an investigation of the incident. Acting Associate Administrator for Pipeline Safety Alan Mayberry issued an corrective action order on Friday that prohibits Colonial from reopening the affected section of the pipeline until the company has submitted a Restart Plan to the agency for prior approval. Colonial has been fined $73 million by the U.S. Environmental Protection Agency since 2003 for spills, including a $34 million fine in 2003 for gross negligence after it spilled almost a million gallons of diesel in South Carolina, polluting waterways in four states. It was then the largest civil penalty ever imposed by the EPA. The company also agreed to spend $30 million to upgrade environmental protections on its pipeline system.